Last week, thousands gathered on the National Mall to celebrate the grand opening of the National Museum of African American History and Culture. One of the legacies this keystone collection memorializes is that of the United States Colored Troops, in which nearly 185,000 men of African descent served during the Civil War. Once recruitment of African-American soldiers began in earnest, the men of the USCT quickly earned a reputation for bravery in combat. They remained steadfast during the siege at Port Hudson, they valiantly led the charge on Fort Wagner at Morris Island, and they played a central role at the Crater in Petersburg. At the Battle of New Market Heights fought September 29-30, 1864 USCT soldiers led a victorious assault against a stubborn Confederate defense. Fourteen African-American soldiers were awarded the Medal of Honor for their participation in the battle, fought north of the James River outside Richmond. 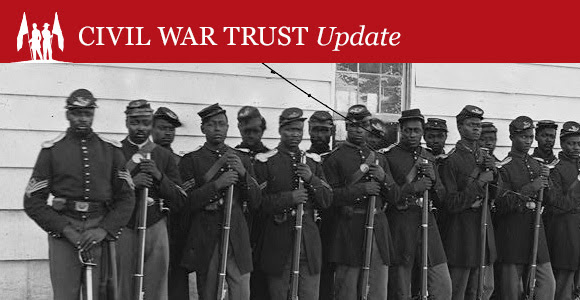 The Trust has saved land associated with the battles above, as well as USCT-related sites in North Carolina, Arkansas, Mississippi and more totaling more than 1,000 acres of hallowed ground. Just as the newest Smithsonian museum shares the stories of African-American life, history and culture, this land honors the sacrifice of thousands of black soldiers who fought in the Civil War.